After a good twenty years of participation in the Highmark QUAD Games, Kathy Schreckengost was taking this QUAD year off but she was not going to be inactive. 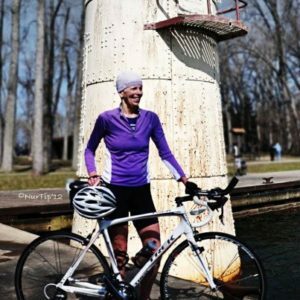 While Kathy is strong in all the four events (she’s holds age group records in the ski and swim and regularly wins her age group in the bike) biking is her great sports love (she has a big crush on skiing too) and was set this year for a summer-long, dream bike tour across the United States. The Tour was an elaborately planned and designed fund-raising ride for a variety of charities that Kathy had strong ties to. The Tour was three weeks and 1,500 miles in when, during a stretch in Montana, Kathy hit some debris along the road and suffered a terrible crash. Broken ribs, punctured lung and broken scapula meant Kathy’s dream tour had come to a nightmare end. Her husband Ray made the long drive toMontanato retrieve her and this is Kathy: on the drive back she emailed me to say she would be available to volunteer at the QUAD Bike if I was in need. It is my thirty year policy to never say ‘no’ to a volunteer yet I emailed back thanking her but urging her to stay home and rest and recover. That’s not Kathy’s way – her daughter Kelly, son-in-law Larry and grandson Zach would all be at the QUAD Bike along with so many friends from her extended QUAD Family. The way she figured it, something about being part of it would help in the healing. So that was Kathy Schreckengost bandaged, slinged and helpful at the registration table of the Highmark QUAD Bike Race just days from the devastating crash and end of her cross-country bike tour. She’s had plenty of wins in the QUAD over her decades of participation but her true spirit in a time of adversity shows the true soul of a real Champion.